Introducing the new Buzz Around by Golden Technologies. Finally, a light weight travel scooter that will carry up to 300 lbs.! 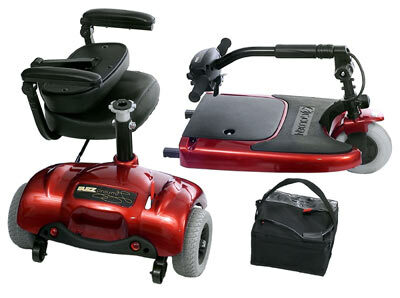 The Buzz Around is loaded with great features long awaited in a compact scooter, such as a contoured, padded swivel seat with flip-up width adjustable armrests, flat free tires and easy disassembly into 4 pieces with the heaviest component weighing only 39 lbs. 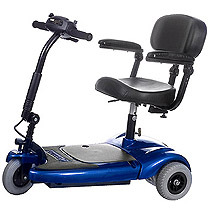 The 70 amp controller gives added power, allowing this travel scooter to handle inclines up to 8 degrees. 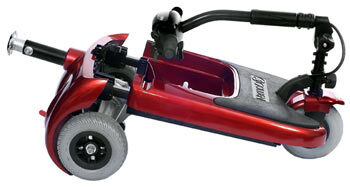 This scooter will fit in the smallest trunk and breaks apart easily in seconds, with no tools. The narrow width and tight turning radius of 31" make the Buzz Around ideal for maneuvering in tight spaces. Light weight travel scooter with a 300 lb. weight capacity! 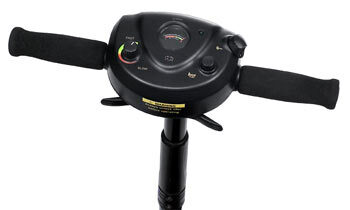 Easy to use control panel and adjustable tiller. Quick and easy disassembly. Take apart into 4 pieces. Heaviest piece ONLY 39 lbs.! 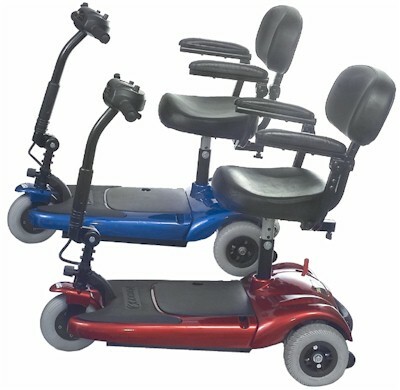 Compact 3 wheel scooter. Disassembles into 4 pieces. Heavy duty weight capacity of 300 lbs.! 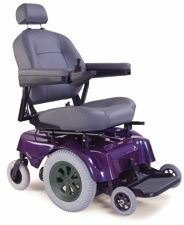 Comfortable, contoured low back padded seat with armrests. Heaviest piece only 39 lbs.! Flat free tires are standard. Motor 24 V DC, sealed transaxle. Fits in the smallest trunk for easy transport. Will handle an 8 degree incline.